But you didn’t come here for our opinion on how much fun the game is – you came here to know if you can play it. Let’s follow the by now time-worn lines of our accessibility framework and find out. 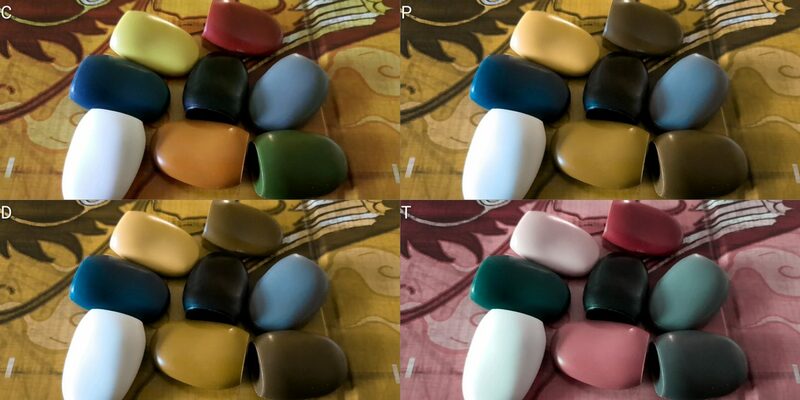 For lower player counts colour blindness need not be a major problem because there are eight player markers and they come in a range of shades that mean you can almost certainly work out a combination that is effective for everyone. However, at higher player counts that’s going to become increasingly difficult to do because the palettes are not colour-blind sensitive. 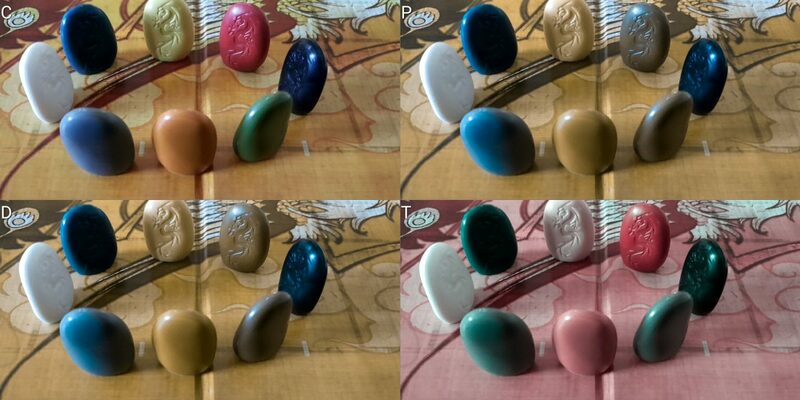 Even for those without colour blindness some of the colours blend together in poor lighting condition. They become increasingly difficult to deal with when any of our usual categories of impairment are considered. The problem too is that the overlap eliminates a non-trivial percentage of pieces from play, and if dealing with two or more different classes of colour blindness in a single game it might be all but impossible to find something that works for everyone. Remember, this is a game that scales up to eight players. It’s not all bad news though, because the markers are just used to indicate position and aside from the tiles (which have no colour information on them) they are the only component in the game with which players will be fiddling. As such, you can substitute any given token for pretty much anything you like. The car from Monopoly for example would be an amusingly incongruous inclusion. Beep beep. As such, we’ll recommend, just, Tsuro in this category. If you want to play it you’ll be able to do so – but that doesn’t really make up for the fact the palette is so indifferent to the issues of colour blindness. 2004 may have been a long time ago but colour blindness was very much a known problem even back then. For those where total blindness is an issue the game is not remotely playable. The tiles are completely smooth, and there are no identifying grooves or other tactile indicators to permit the game to be played by touch. That’s a shame, because if an indentation had been applied for each path the game would otherwise be entirely playable. This is an example of a serious delta between ‘what could be’ and ‘what is’ – usually when we consider component design we’re talking about an incremental accumulation of pluses and minuses. This here would be a straight up F becoming a straight up A with just a little modification. For those with some ability to differentiate visual information, the story is more positive but not overwhelmingly so. The tiles exhibit high contrast and those with minor to moderate impairments should be able to assess the path information with the use of an appropriate assistive aid. However, the tiles sprawl across the entire board and tracking a single line to see where it terminates is going to be more challenging given the number of intersecting and interleaving lines. Not impossible, but difficult. Well, how did we end up here? The only point at which you’re going to have to do that is in the playing of a tile, and in that case you’re assessing between three, each of which may have four possible rotations. So, essentially twelve possibilities with varying degrees of significance. The extent to which visual parsing is required depends on how heavily connected the board has become, and how many tiles are adjacent to the space where you’ll be playing yours. It’s entirely possible that playing one single tile will take you across the entire breadth of the board. If you missed a switch of lanes or a loop you might find yourself either out of the game or in a difficult position without having fully appreciated the impact. The board at its maximum is made up of a six by six grid of tiles, but the interconnectivity is much greater than those tight dimensions might suggest. It can be a bit like one of those ‘solve the maze’ problems made all the more challenging by the fact your start and end point shift from turn to turn. Careful tracking of the line is certainly possible and this is one of those games where very close, painstaking inspection of the track won’t reveal any game intention. You’re going to play one of your tiles, and all you’re working out is where everyone goes. You could potentially be having to do that with as many as eight pieces (although if you are the spoilertastic ending is ‘rocks fall, everyone dies’). If you’re happy with that, the game is playable, albeit very slowly. Otherwise, the game has no other components or design considerations – fundamentally it’s a very simple and straightforward game. We can’t recommend Tsuro in this category, although we would say that the game is likely playable for all except those with the most serious visual impairments. It’s just that it will be a considerably less enjoyable affair unless you like the idea of doing several line-tracing puzzles every time your turn comes around. Maybe that sounds awesome – maybe it’s like Chess Boxing. Let your feeling on that be your real guide here. Here, we have some glowing words to say – Tsuro is a game that we think will work for almost anyone. If you can trace a line, you can almost certainly play Tsuro. There might be some difficulties in dealing with radically different levels of spatial intelligence, but overall Tsuro is likely to be a satisfying experience at all levels of cognitive impairment. There are no complex decisions to make, and nothing substantial that need be memorised. The sole thing I would say here is that the rules require placements to be final – that when you lay down a tile, it can no longer be moved. In some circumstances it might be necessary to relax this rule and permit it to be placed and then rotated. The act of carrying an imaginary line from a separate tile into its contiguous context is one that may be difficult for some to bear. This is only a small adjustment though, and all it does is make an explicit provision in play for something most people will be able to do without serious conscious thought. As such, it doesn’t have much real impact on how the game is experienced. We’re prepared to strongly recommend Tsuro in both categories of cognitive impairment. 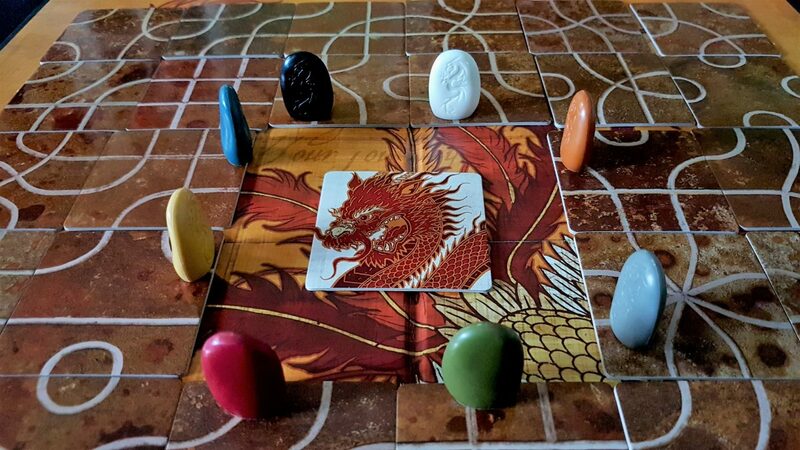 Tsuro incorporates a degree of player elimination, but it plays so quickly that it need not be an issue for most groups. Player elimination by itself is often a troubling game system when we talk about emotional accessibility, but the true impact is a function of how long it is before you’re back and part of the action. 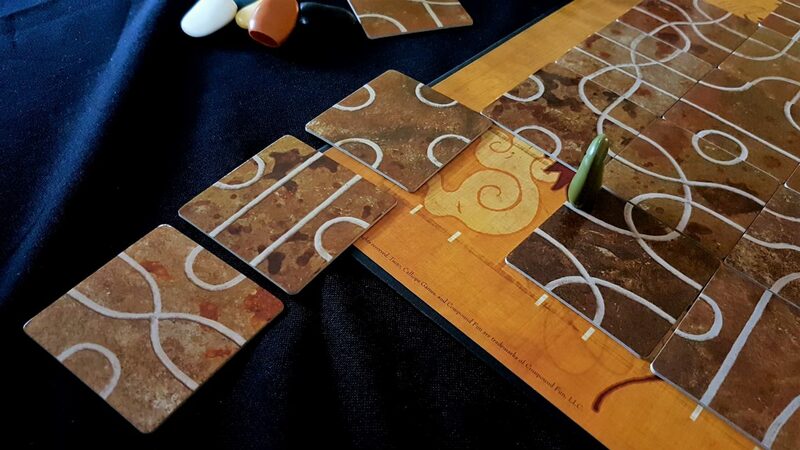 With Tsuro, games are quick enough that it shouldn’t sting too much. You might be knocked out of play almost instantly and then it’ll be fifteen or so minutes before you’re playing once more. If you think that’s too long for someone to go without being part of the action, then that should be a warning signal. There is no tile or rotation here that prevents the player being eliminated because every single one leads off the board. To a certain extent, this is down to the player playing poorly – as far as is possible you want to stay away from the edges of the board, and ideally away from other players too, until the competition has thinned out a bit. However, your genuine options for executing on a strategy are hugely limited and in the end it all feels pretty arbitrary. Being eliminated by another player introduces its own tensions too – you don’t just get eliminated in that circumstance, you get eliminated by someone. In a sensible group nobody will read too much into their own failures or successes in Tsuro, but still – you were bested and that can be a problem for some people. Overall though we recommend Tsuro in this category – what issues are present would be more significant in a game where player agency was more tightly coupled to outcome. Tsuro isn’t that game. Placing tiles and moving markers are the only activities in the game. As in our teardown of Takenoko we noted that sometimes it is manipulating the components themselves that lends a certain joy to play. In Tsuro, having your marker follow the path you just laid down is from where a non-trivial portion of the enjoyment in the experience will come. There are no judgement calls or ambiguities when a tile is placed – the marker is going to go where it’s going to go regardless of who moves it. Still though, the act of physically moving a lovely component has a value we shouldn’t underestimate. Otherwise, the game is playable with verbalisation. There are only three tiles, and only one place they can go during your turn. Verbalisation is as simple as saying ‘rotate tile one three turns left and place it’. You don’t have to negotiate or provide a deeper explanation. Your tiles go where your marker is. Verbalisation in this way may make it a little more difficult to visualise the path your marker will be taking, but it’s unlikely to be a major issue. We’ll recommend Tsuro in this category, but just bear in mind that sometimes it’s nice to fiddle with components. Board games are tactile experiences, after all. I have zero concerns here. The art is an abstract Chinese aesthetic that is entirely appropriate for the theme, and nothing about the game is gendered or makes use of troubling content. The manual is careful to use ‘his or her’ or ‘he or she’ throughout, avoiding the common assumption of default masculinity. I would prefer gender neutral pronouns, but not enough to make a big thing of it. Even the markers are just little plastic tokens, with no overt gendering or even real characterisation. Tsuro is basically an abstract game with a thin veneer on top. The game RRPs at £25 and scales well from two players right up to eight. That’s a hugely useful range of players for a reasonably bargain price. It’s not a game you’re going to keep playing and playing with your regular group. I suspect though it’s one you might play more than you think. Especially if you’re commonly in the vicinity of people who have never tried a designer board game but are interested to know how they work. It is uniquely suited as a, urgh, gateway game. As such, it’s worth thinking of it like a specialist tool in your toolkit rather than a potential reliable favourite. There’s not a lot of repeated play in the box otherwise. In any case though if you like the game price is absolutely not something to baulk at – you get a lot for your money. We strongly recommend Tsuro in this category. The game makes use of no in-game text, and doesn’t require any communication on the part of players. It helps to be able to make ‘zoom’ noises, but I suspect that may be entirely optional. As is often the case, if physical impairments are going to cause a problem with play, verbalisation won’t be as effective a strategy if a communication impairment must also be taken into account. However, given the limits on the options you have a workaround can almost certainly be constructed as long as a player has some ability to indicate assent or dissent. Games of Tsuro are low intensity affairs, and generally they’re over in about twenty minutes barring accessibility considerations. All you’re doing each turn is picking a tile and following a path – there isn’t a lot of which you need to keep track, and no tense or stressful decisions to make on your turn. As such, there’s nothing about it that would be likely to exacerbate physical or emotional discomfort. Even if it’s necessary for a player to drop out, you can easily continue on with the game by playing a random tile from their hand in a crude automata fashion. Every single tile is valid in every single circumstance, so in this way you can see through to the end of play without impact on everyone else. You can also just skip their turn, and have them act only when another player places a tile that will move them. Neither of these are formal solutions, but they work reasonably well if necessary. 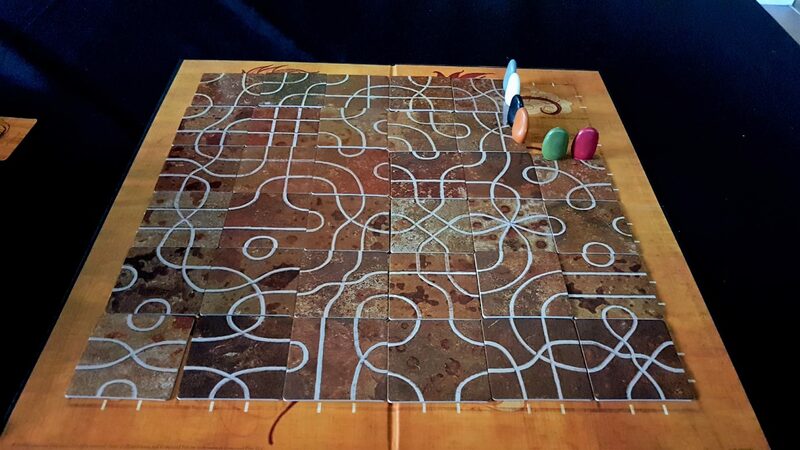 Given the simplicity of turns in Tsuro, it also doesn’t have a lot of down-time – you’re likely to be emotionally invested during other turns too since every time a path touches your current tile you move as well. As such, the long gaps between play will likely not be an issue for intersections of emotional and cognitive impairments. 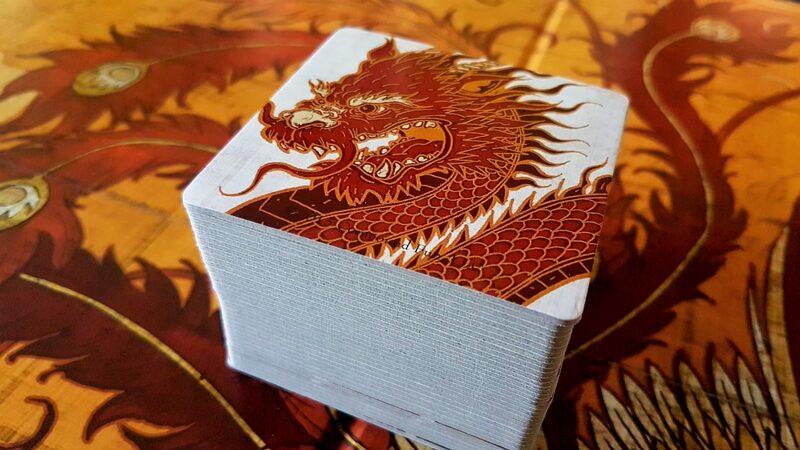 With some component alterations, Tsuro could genuinely be a contender for our most accessible game ever. It’s the visual accessibility category that brings it down most heavily, and grooves in the paths would be sufficient to make it fully playable even in conditions of total blindness. It doesn’t do that, but if it were possible to do such a thing the impact would be significant. Sadly though we don’t teardown the game as it could be, we teardown the game as it is. Even with the problems we’ve identified, Tsuro does remarkably well in almost every category. Its simplicity is such that it thrives in cognitive spaces. Its low-aggression model of competitive play means it’s even a relatively safe bet for those with emotional accessibility considerations. It’s important that a, urgh, gateway game be accessible in terms of its rules and design. Tsuro shows too the value that accessibility in the Meeple Like Us sense can have in picking a game to win over your cardboard virgin friends. Is that reason enough to buy it? That’s for you to decide. You know our view, but the choice is yours. Actually I would score it lower on colour blindness. I am red-green incomplete, and with my set I can play with at most one other player.